" Hiking boot repair mountaineering rock climbing hiking boots Asolo Scarpa Meindl Zamberlan Sportiva"
We replace your old soles with this vibram sole. Very durable. These soles are placed on hiking boots such as Asolo, Meindl, Scarpa, Zamberlan and many more brands. Hiking boot repair with vibram clusaz soles. Large contact toe for grip on rocky surface, Good grips on ice and snow, high profile cup sole for foot protection, undercut heel for secure braking. The special toe and heel design is provided with a groove for the attatchment of Crampons. We replace the old sole with a full moulded sole of good quality rubber that is suited for mountaineering, hiking or rock climbing. It is a hard wearing sole that are made specifically for mountaineering boots . When the upper of your boots are still in very good condition, replacing the soles will add more life to your boots. 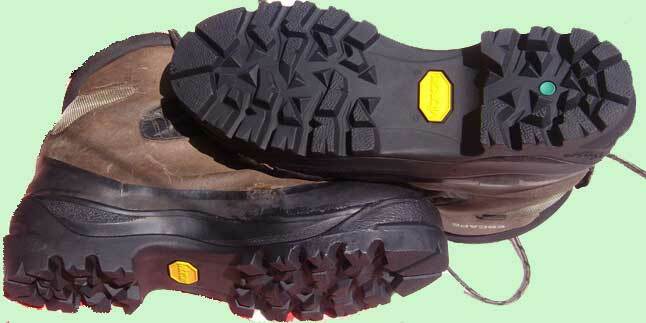 The Vibram Clusaz can be used to resole Scarpa, Asolo Meindl, Zamberlan and other hiking boots. A traditional repair, with long lasting quality. vibram Clusaz soles will add more life to your much loved boots. We remove your loose sole which is still in good condition, clean and roughen both surfaces before applying the cementing process. This can take several days to complete and cannot be rushed. Care is taken to ensure that the surfaces cement properly and then where possible we stitch the sole to the uppers.